In order to fully appreciate the value of your University of Maryland Baltimore County ring, it is important to understand the intricate process that has been used to make generations of University of Maryland Baltimore County rings. Just like the thousands of proud alumni who proudly display the most visible connection to this great University, your ring will pass through over 100 of our trained artisans' hands as it makes its way from the time you place your order to arriving on campus for the University of Maryland Baltimore County ring ceremony. The manufacturing of your ring starts in the Herff Jones wax room. A master mold, hand-crafted in zinc alloy, has been created for each ring style. This die is pressure injected with wax to create a one-piece ring -- actually your ring which starts out in wax form. 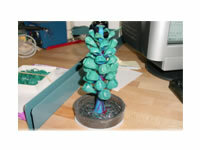 The wax rings are sized to meet customer specifications and attached to a tree (see image below) in preparation for casting, which is the process where the wax will become gold. The University of Maryland Baltimore County ring, along with the other rings on the tree, is placed in a flask and filled with 'investment', which is a precise mixture of a substance similar to what dentists use to make impressions. Once all air bubbles are completely removed from the investment, the flask is placed in a gas-fired furnace and slow heated to 1300 degrees over a period of 12 hours. 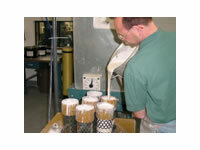 This process, known as lost wax casting, melts out the wax and prepares the flask to have gold poured in. Yes, we said poured - as molten gold at over 2000 degrees is vacuum poured into the flask to create a metal version. 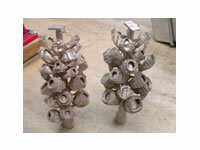 Once cooled, your ring is removed from the tree and ready for its first inspection. Your ring now enters the polishing department, where our jewelers use polishing compounds, brushes, and rotating wheels to highly polish your ring by hand. After the ring is polished to a brilliant shine, it is ready to be set with stones and panels, just like in a fine jewelry store. A highly-skilled stone setter will use their steady hands and various tools to hand-set the stones, and hand-roll the gold bezel to keep these stones forever locked into your ring. 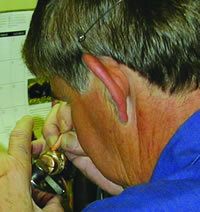 Once again, our quality control department will inspect your ring to guarantee it meets your satisfaction. Before its ready to ship, your University of Maryland Baltimore County ring will have every detail highlighted by a felt wheel and will be buffed to a lustrous appearance. A few final intricate details are completed. 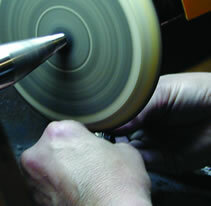 Once your ring has been carefully inspected for the final time, it is ready to be packaged and shipped …. And the University of Maryland Baltimore County tradition is yours for a lifetime.